With “Canvassing the Masterpieces”, KAZoART peels back the layers and unravels the mysteries behind famous works of art, revealing their innermost secrets. 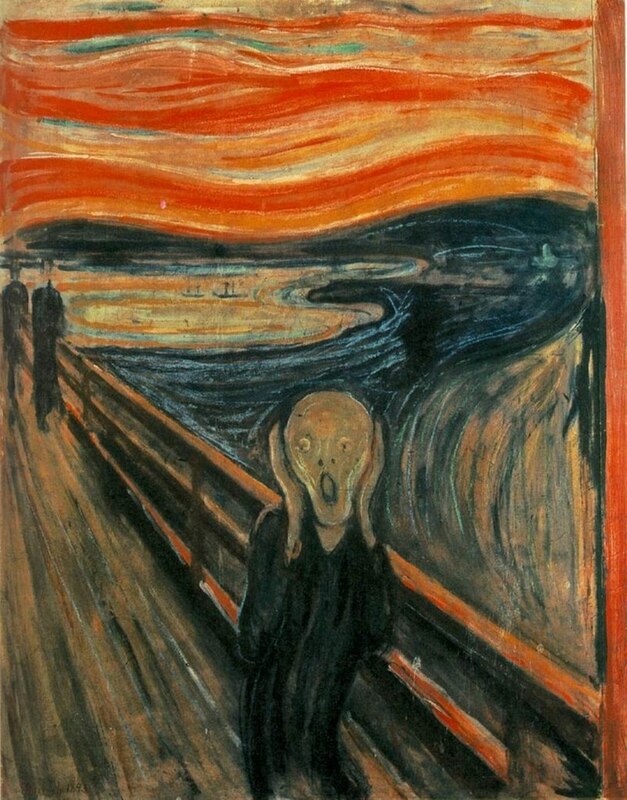 Today we’ll cover The Scream by Edvard Munch, a world-famous Norwegian artist. A true precursor of modern art, Munch was a tormented soul who used art as a means of exorcising his demons. Together, let’s illuminate this dark and eerie subject. Edvard Munch (1863-1944) is perhaps one of the most famous artists of the 19th and 20th centuries. Recognised as a forerunner of Expressionism and more broadly as Modern art as a whole, the work that launched him into notoriety is his famous Scream, or Skrik in Norwegian. Originally painted in tempura on a cardboard surface, it has been many-times copied and repeated. In fact, there are five existing versions of this same work, all made between 1893 and 1917. Three are paintings, one a pastel and the last a rare lithograph. The latter has spent the greater part of its life in a private collection. However, it has recently been lent to the British Museum for a large-scale Munch exhibition opening this April. To understand the tone of Munch’s art, we first need to be clued in on his upbringing. From a very young age, he was faced with sickness and death. His mother and one of his sisters died when he was just a young boy. Often resulting in recurring bouts of depression and neurosis, his experience with loss and the fragility of mortality would haunt him for all of his life. Therefore, his art seeks to embody human emotions, especially feelings of anguish, anxiety and pain. 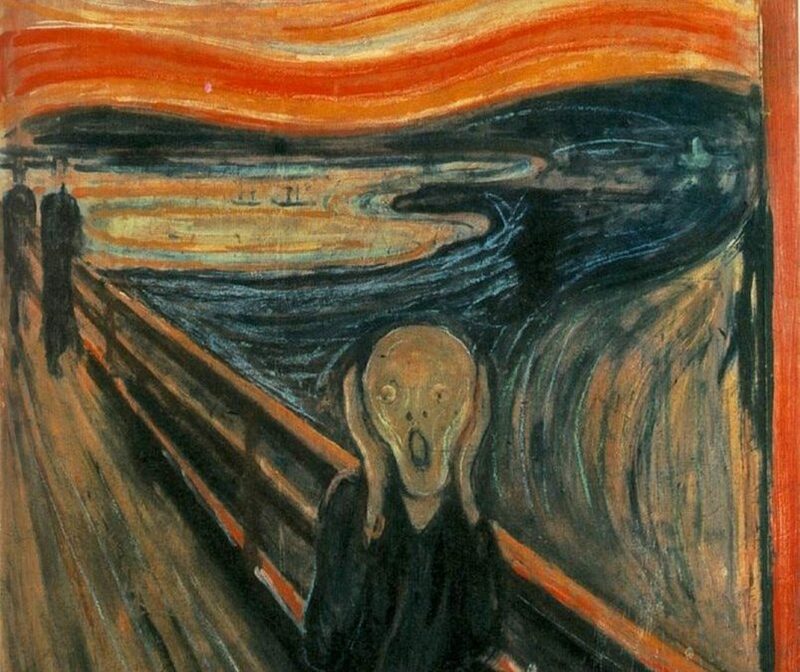 What many do not know is that The Scream is actually one painting in a series called The Frieze of Life – an allegory about the unfolding of the human experience, from birth to death. So who is screaming then? When taking Munch’s own words into account, one may wonder about the origin of this cry from which the painting received its name. Although we’re inclined to believe that the character in the foreground is producing this earth-shattering noise, it may not be the origin of the cry after all. The fact that he or she is covering their ears reinforces the hypothesis that the sound is external, happening outside our frame of reference. Many, however, hold that this was inaudible to everyone except for Munch. Given his disturbed nature, did he only imagine it? Regardless, it was nonetheless real and dreadful for him. 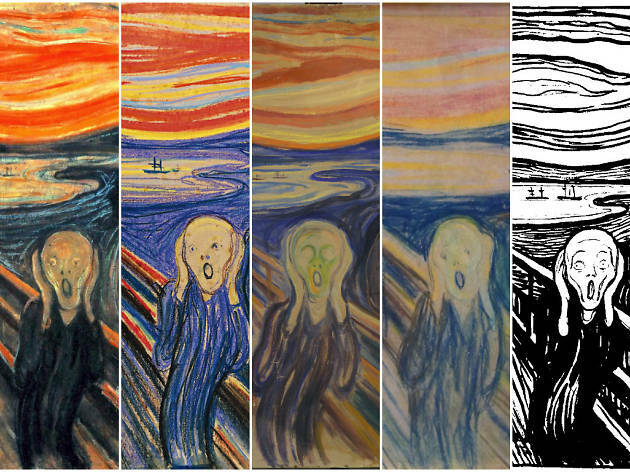 Perhaps the most plausible explanation is that Munch depicted the moment at which he was faced with his own mortality. His personal, existential anguish is made manifest in the form of a reality-splitting, “infinite” scream. Krakatoa, in Indonesia, erupted, causing one of the most severe natural disasters in recorded history. The sound was estimated to be around 172 decibels and could be heard from 4,800 kilometres away. Volcanic ash spewed into the atmosphere and was carried all the way to northern Europe. 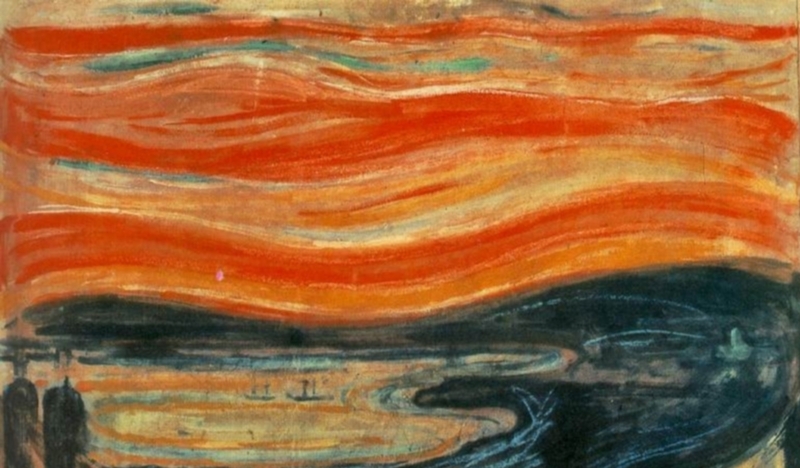 Thus the origin of the hauntingly vibrant sunsets, of which Munch was a witness. This apocalyptic sky likely triggered him, causing strong emotions. Remembering this moment ten years later, he painted the picture from memory. What’s more, these red shades lend themselves to Munch’s narrative of pain and suffering. What is it about this hairless and emaciated character that appears to be barely human? In 1978, art historian, Robert Rosemblum, published an interesting hypothesis regarding Munch’s sournce of inspiration for this ghastly figure. In 1889, Edvard Munch lived in Paris. Coincidentally, the Universal Exposition was held there in the same year. One of the favourited exhibitions were the mummies of the Chachapoya people, who were natives of Peru. Munch reportedly saw these mummies, which further reinforces Rosemblum’s hypothesis. 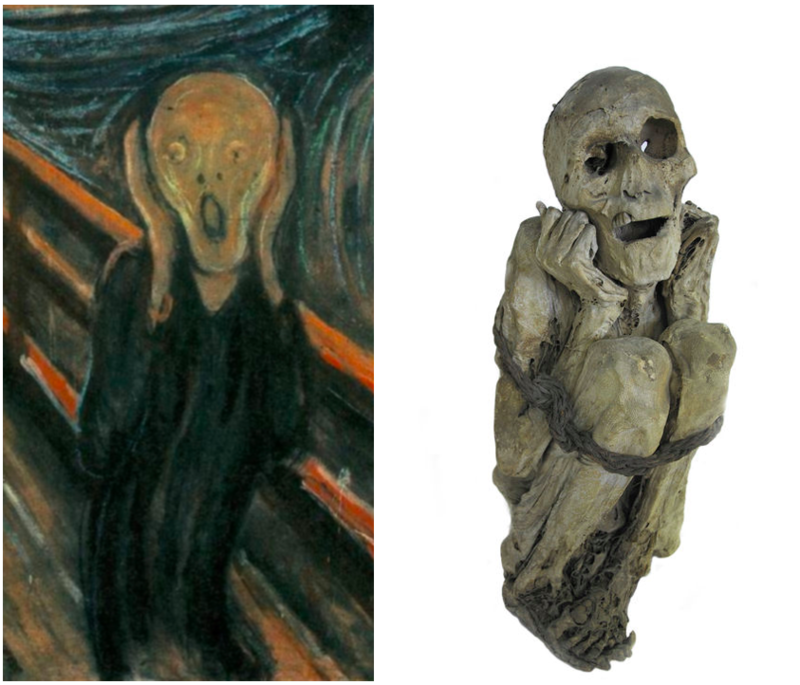 Bearing striking similarities with the character in Munch’s painting, the positioning of the hands, colour of the skin, and mouth agape are all features that point to the Chachapoya mummy as being Munch’s unusual inspiration. Interestingly enough, these same mummies inspired Paul Gauguin’s paining titled Where did we come from? What are we? Where are we going? 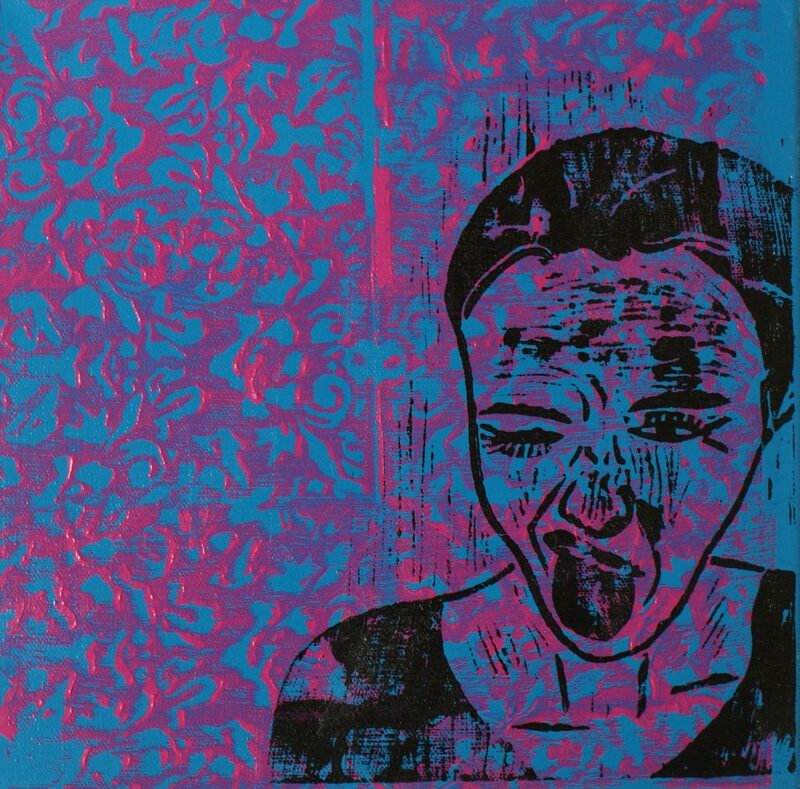 On KAZoART, the artist Claire Moog depicts a portrait of a young woman whose distress and impatience are coming to a head in a scream. Do you see any of Munch’s influence in this work? If so, do you find it to be conscious or intentional?